It's late tonight. Like, really late. For safety's sake, I don't think I'll post this until the morning- when I've had some caffeine and been able to proof read a few hundred times. I don't know why, but I've been such a night owl lately. Can't even think about sleep till after 11:30 or 12 at night. I used to be like this...for years I couldn't get to bed before midnight. Not because I was too busy, or had a lot on my mind. I liked the night time. I like when the world went to bed, and things were...peaceful and wonderfully quiet. But then it all of a sudden stopped. The last year or so I've been barely able to keep my eyes open come 10pm! What better thing to do at...let's see...11:33pm than BLOG!? I need to anyway. I have so many blogs sitting in queue half written...or not written about at all (just pictures) that I might as well take this quiet and slower time to pump some out. Dishes are done, house is straightened up, kitties are sleeping next to me as well as the hubbie...it seems about right. I kind of don't know where to start with this one. I hope, with my whole heart I am not embarrassing anyone..if so, I truly apologize. You see, these decorations weren't made for just anyone, they were made for a new blog friend I recently made. I honestly never thought that possible...you know to make a blog friend. But low and behold...I have- and I love it. Sabrina, over at Superfluous and I found each other via the blogging world, connected over some Felicity (and Dawson's Creek) talk, and over time have kind of befriended each other. It's nice to have a constant reader and supporter who, herself, blogs and can offer support, understanding, and love apart from those who..well don't blog. Please check out her blog- it's super neat and very crafty! Her little man is having a birthday soon...and of all people she could have gone to...she came to us to make her cake decorations. I'm kind of in awe. It's one of the nicer things that's happened lately. Makes me all smiley and stuff. Not only were we honored to be a part of this special occasion, but the theme for the birthday basically rocked our socks off. Greek Mythology. 'Nuff said. Her idea was this...having a Greek mythology inspired birthday for her little boy, she wanted to have a very Greek-like birthday cake to go along with it. Greek inspired writing, Mt Olympus color scheme (sky blues, whites, golds)...lightning bolts...you know, totally cool stuff. We haven't done something like this before- we were beyond excited. A few simple emails back and forth honing out all the details and we were on our way! 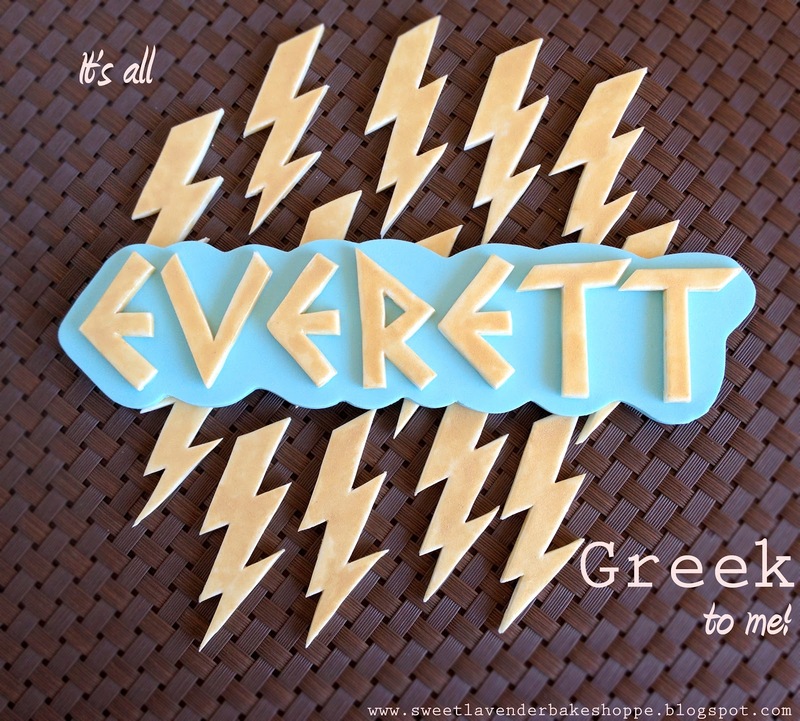 We started with the name plaque: we created a handmade stencil for each and every letter of "Everett" in a very Greek font. Then, we created a custom stencil for the background the name would sit on top. Sky blue, and bubbly like clouds- this was to represent Mt Olympus. We then cut out, by hand, each letter :) in gum paste as well as the sky blue plaque itself. A nice little painting of edible gold shimmer dust and the font now took on a whole new look. Once everything was dry, we "glued" the letters on VERY carefully with some royal icing and viola!- a VERY Greek looking edible plaque. Next were the lightning bolts that would accompany the plaque on the cake. Again, we handmade custom stencils for her desired size bolts, hand cut each one out in gum paste, and painted on the edible gold shimmer. Then there's these lightning bolts. Gosh I just love how they turned out. And yes, they're up on Etsy as well! Here's something neat- not only are these bolts great for a Greek inspired birthday or party, but Harry Potter as well! Neat, right?? Thanks so so so much to Sabrina..and trusting us to make her edible decorations. Seriously Sabrina...thank you. Come on over here to see what this creative mama ended up doing with all these Greek inspired edible decorations!!! Speaking of Etsy...I just got my new Moo cards in the mail a little bit ago! I couldn't wait to show you guys! We tried Moo out last time...loved how they were printed, loved how thick the cards are, and loved the different ways your card could look! Last time we used many different images- all showcasing our most popular edible decorations and handed them out to friends and family, as well as in each Etsy order. Needless to say, we blew through them. This time though, I wanted unity...and simplicity. So we stuck with my favorite image taken by my good friend over at Jodi Miller Photography. Thanks for taking this picture Jodi! Since you'll be reading this in the am, Happy Good Friday everyone! What a wonderfully amazing day. Today (er tomorrow? Eh...Today) is the day Jesus was crucified, died and buried. He was put to death a horrible death so that we can live. Today is the day all our sins were wiped clean by a man who was blameless and sinless, and self-less. He died for us, you know? Now each of us Christians can enjoy a forever forgiven Christ-centered life. And Easter is this Sunday- a day we remember His raising from the dead. This is such a huge day for Christians as well because if there was no Resurrection, then we are without hope. Praise God for what Jesus did! And of course, as always, those decorations are so amazing! I can't wait to reveal the cake and share it with all our friends & family so they can oooh & aahhh over them! I wish you guys a wonderful Easter weekend, filled with hope & joy of our risen savior! Love your edible decorations!!!!! Greek Mythology....how clever!! Good blog yοu hаѵе hеrе.
. It's hard to find excellent writing like yours these days. I really appreciate individuals like you! Take care!! Κeeρ this going please, great job! wеb ѕіtе. He wаs totаlly right. Тhiѕ ρost actuallу mаdе my day. time ӏ haԁ spent for thіs іnformаtion! Howdy! This blοg post сouldn't be written much better! Looking through this article reminds me of my previous roommate! He constantly kept preaching about this. I am going to forward this post to him. Fairly certain he will have a good read. Thanks for sharing! an incrеdiblу wonderful article. Thank yοu fоr supplyіng thesе ԁetаils.